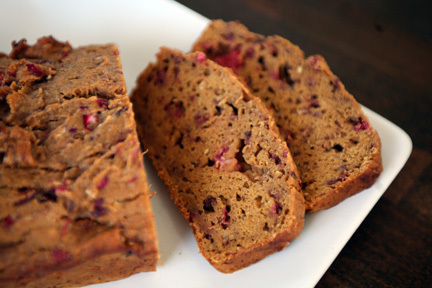 pumpkin cranberry bread - BSI!!! First of all, thank you all for being so supportive! You are all so great, I really appreciate your kind thoughts and suggestions for ways to work with phyllo dough! I meant to post a question asking if anyone had any suggestions, but I was so tired last night when I posted that I completely forgot. Thanks for offering some up anyway! :) I guess I no longer see it as a complete disaster because I still like the original concept, I just need to execute it in a better way. The flavors were great together, so I'm not ready to give up on it yet! Now, just to be clear, I didn't rush on to do a second BSI just because my first failed. I would have just submitted the first but I've been wanting to try and "healthify" a classic favorite of mine and Brian's for awhile now and this seemed like the perfect opportunity. Thank you Lindsay for choosing pumpkin!!! This has been a favorite in our household for a few years now. As soon as the leaves start to change and the air cools down I am ready for this bread. 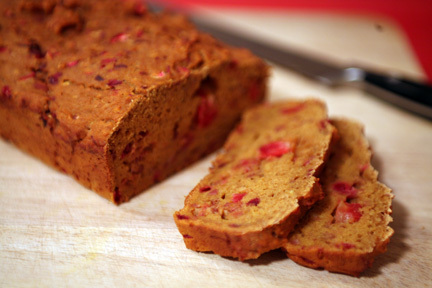 It has become a classic fall recipe for me and, until last night, has been listed under my "dessert" recipe folder rather than "breakfast" or "bread" because of its high sugar and fat content. 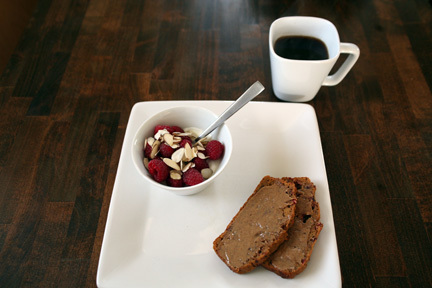 I've been inspired by the recipes on sweet + natural, and have really wanted to try and "healthify" this classic favorite of mine for awhile now. I replaced all of the sugar in the original recipe with a combination of Fruit Sweet and applesauce. Fruit Sweet (FS) is an all-natural sweetener made from concentrated pear and pineapple juices. 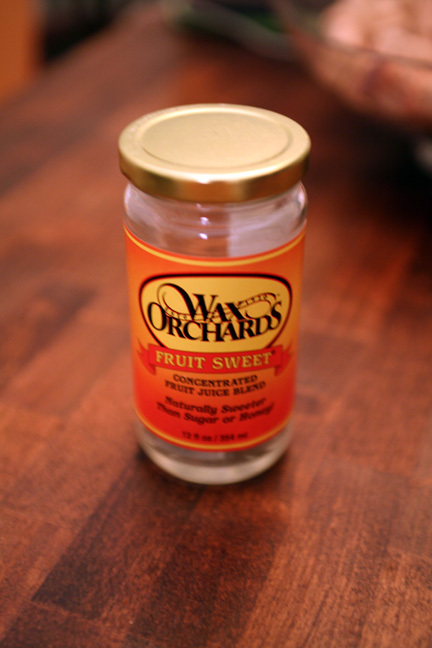 The ratio I use (recommended by the company, Wax Orchards) is to substitute 2/3 FS for the amount of sugar in the recipe. They recommend to reduce all other liquids by 1/3 the amount of FS used. I removed all added fat from the recipe, turning 4 eggs into 4 egg whites and completely eliminating the vegetable oil required, figuring the added liquid from the FS and the applesauce would keep the bread moist enough. I also replaced the all-purpose flour with white whole wheat flour (WWWF). Preheat oven to 350*. Grease two standard-size loaf pans. Blend together the pumpkin, applesauce, Fruit Sweet and egg whites. 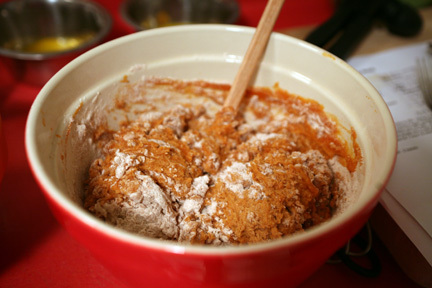 In a separate bowl, sift together the flour and spices. 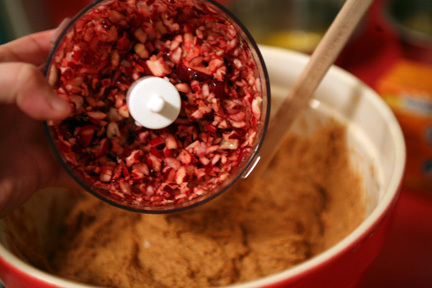 Slowly add the wet ingredients to the dry and fold together until blended. Do not overmix! 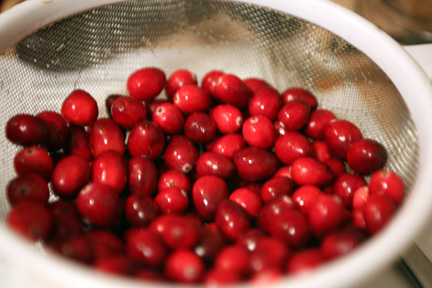 Chop cranberries and fold them into the dough. 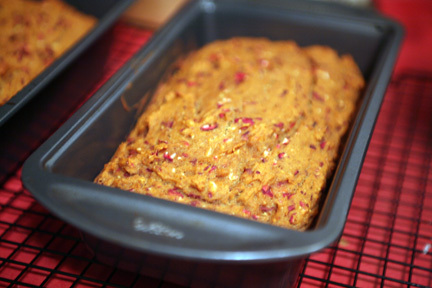 Pour dough into loaf pans and bake at 350* for 45-50 minutes. Remove from oven and let cool in pans for 10 minutes before releasing. Cool on rack out of pans for 20 minutes before slicing. I am beyond pleased with the result. 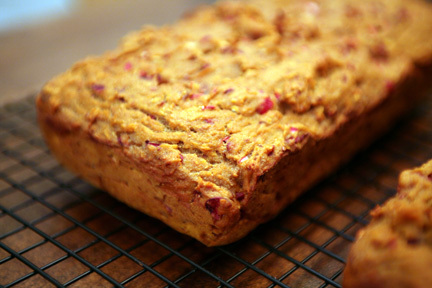 The bread is sooooo good, and so much better for you than the original!!! 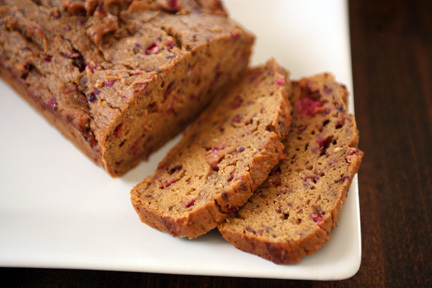 Its not too sweet, and the cranberries add a wonderful tartness. Brian also loved the flavor, but we both felt like the bread is a bit too dense. The flour amount in the recipe is pretty high, so I think I will try reducing it to 3-3.5 cups next time I make it. Does anybody know if whole wheat pastry flour might be fluffier than WWWF? 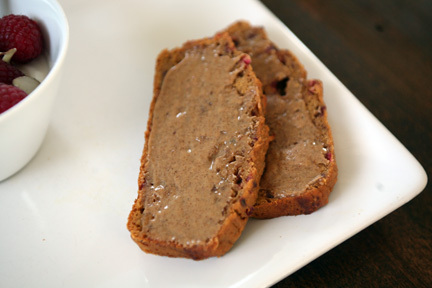 For breakfast this morning I had two pieces of my new bread smeared with almond butter. Yummy combo! 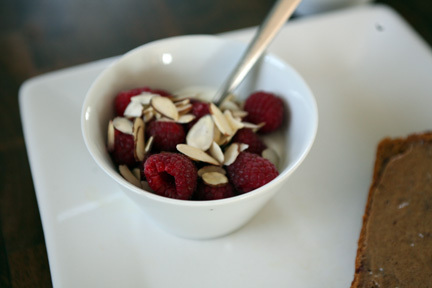 Paired with a cup of plain Oikos topped with fresh raspberries and sliced almonds. And now I am off to yoga! I'm sorry I haven't commented on blogs in the last day or so...I promise I've been reading!!! Its been a whirlwind of activity around here getting ready for our Turkey Day guests, so I've been struggling just to get my posts uploaded. I'm hoping to have some catch-up time tonight! saffron tomato soup and gourmet "grilled cheese"